Barfeod’s test is a qualitative test used to check the presence of monosaccharides in an unknown solution.Barfeod’s reagent react with monosaccharide and precipitate is formed.It also react with disaccharide but the reaction is slow and monosaccharides can be easily distinguished from disaccharides and polysaccharides. When barfoed reagent mix with solution of monosaccharide or disaccharide, and heated in boiling water bath, they react and crystal precipitate is formed. Copper acetate which is present in barfoed’s reagent convert to copper oxide and give brick red precipitate when react with monosaccharide or disaccharides.Monosaccharde react fast while disaccharide react slowly. Take 3 to 5 ml of barfoed’s reagent in a test tube. Add 3-4 drops of original solution to the test tube. Then put the test tube in boiling water bath for boiling.The reaction will occur and precepitate would be formed. Monosacchardies give brick red precipitate with copper acetate and acetic acid.They usually appear within seven minutes.If they appear within seven minutes, it means that monosaccharide is present in the solution.If brick red precipitate are formed after seven minutes, it means that disacchaides are present in the original solution.And if precipitates are not formed, it means that solution doesn’t contains either monosaccharides or disaccharides. Add more amount of barfoed reagent as compared to solution. As mentioned in procedure above. Keep a stop watch or just watch with yourself and note time when you put test in boiling water bath. Water should be boiling. Don’t put test tube in water if it is not boiling. Remove the test tube regularly and check if precipitates are formed or not. If ppt are not formed, keep it in water bath again quickly. If precipitate appear in 7 minutes, it means monosaccharde is present in the original solution.But if precipitate appear after seven minutes, it means that disaccharide is present in the original solution. why barfoed reagent give the red ppt..? why we not use the fehling solution inthe place pf barfoed reagent?? we don’t use fehling solution here because fehling test is used for detection of reducing carbohydrates and does not react with non-reducing carbohydrates while barfoed test is for the detection of monosaccharides and disaccharides. Why monosachharide react faster than diasachharide…? Dear Sir I have one doubt also face very difficult situation. my problem is, I was receive milk from collecting center but those peoples are adulterate by glucose. can i used this method for finding it? you are mention mono & Di saccharides test but already milk has lactose it is Di saccharides so how can find which is adulterate glucose? please say some think I m waiting for your prompt reply. This test would be positive for both glucose and lactose…but it would not be useful if both glucose and lactose are present..if you want to know that milk has glucose or not then you can use this test…if ppt are formed before 7 minutes then it means that both glucose and lactose are present (as lactose would be definitely present) but if ppt are formed after 7 minutes then it means that only lactose is present. Hope this helps…if you have further questions, feel free to ask. Do visit our site again for more medical related stuff. What is the negative result for this test? read the first para of this post. compared the results of both…there is nothing logical in it. you can collect discussion from this post…pick important points from here. Why is that the monosaccharides forms ppt faster than the disaccharides? read the principle of this test above, it is clearly written then monosaccharides reacts faster then dissaccharides. That didn’t answer the question, which was WHY? sorry, i don’t have the exact answer but will ask for you from someone..
Do u know about christen barfoed and how he find this way to find reducing monosaccharides and disaccharides?it’s necessary for me to know the answer pls help me. sorry don’t know about the history of this test. Google it. Or ask in yahoo answers or in quora. Don’t know the exact answer but probably due to need of less energy for reaction because of short chain molecules. 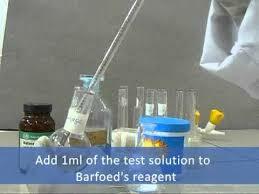 What will happen if we add more original solution than barfoed’s reagent? i think it will not give results….but do it yourself and then let us know here. When you test starch with Barfoed’s reagent, what would be the answer, positive or negative? Explain your answer by giving reasons and structures. it would be negative. because barfoed’s reagent react with monosacchardies very fast while with disaccharide slow…that means that when CHO chains length increases it would react slow with barfoard reagent. And as starch is a polysaccharide, it would react very slow and we say that barfoed reaction is negative for starch. Sorry can’t draw structures etc and there is not any image of reactions for your question in google. What would be the result if we combined the glucose to barfoed’s reagent ? same as to control(distilled water) with barfoed’s reagent? same as fructose with barfoeds and lactose with barfoed’s reagent? Explain why ?? if you use glucose solution then ppt should form in less then 7 minutes as glucose is a monosaccharide. What is the difference between the precipitate of Barfoed and Benedict test? Hi …What is the carbohydrates that give negative barfoed test??? What is the equation involved in Barfoed’s test using Galactose? precautions are mentioned above in post. as i have mentioned in some of the posts that you will do different tests starting for molisch’s test and if positive going towards others. this way you can find which sugar it is…as there are separate tests for different sugars.